A Tiffen FL-D filter is used when you wish to correct for the greenish tone that appears when shooting daylight film under general purpose fluorescent lighting. This filter is glass and measures 75 x 100 mm (3x4") x 4 mm thick. NOTE: The FL series of filters alone does not always guarantee 100% correct color balance when shooting under fluorescent lighting. They are general purpose filters intended for moderate correction and will not, by themselves, necessarily provide perfect color rendition. An FL-W filter is used to balance daylight film under warm white or white type fluorescent lamps. 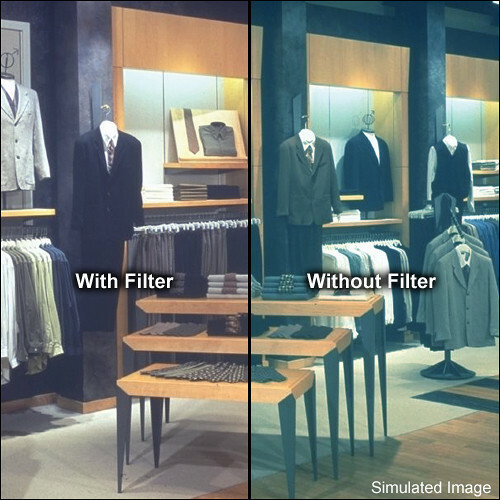 An FL-B filter is used to correct the color balance when shooting tungsten film under fluorescent lighting. Fluorescent lamps burn at many different temperatures and often require more demanding filtration for exact results. For specific filtration and professional use, it is strongly recommended that a color temperature meter be employed along with Color Correction filters (i.e.CC30M) when shooting under fluorescent lighting. This is the only proven way to achieve exact color correction.